In 1982 Chris recorded an album for Magnet Records called "Smile". Despite it's joyful name the album was thought to be too emotional and dark to be released and consequently all tapes and most of the artwork were destroyed. Or so we've been told.... Some years ago the original cover art for this alum resurfaced on an auction. And now also the master audio tape is found again! It contains ten songs. That is suprising, but would it really come out? And has Chris a saying in this? I've seen the artwork before, somewhere on FB I guess. You keep the suspense high, I'll follow this subject closely. Thanks for the news Bart! All these thoughts I have passed to the younger Russian CR fan, Ivan (Vanya) Reynov, who is active on social networks and he started to try to get into contact with everyone who could possibly know anything on this Smile record, on my advise. He was even going to try asking CR himself before the latest gig here in St. Petersburg, but did not have a chance to meet CR anywhere but on stage (where he jumped right at the gig to take photo with CR!) so he tried CR teammates like Neil. Thus, I suspect he might have something to do with this master tape finding, having triggered someone to recall and search for it. And of course, I hope talking on Smile release may trigger other old rare stuff releases. Keep the fingers crossed. Hope to hear from Chris soon. Last edited by andrew fischer on 24 Jul 2018, 14:26, edited 1 time in total. I hope so, but in the past the record companies haven't been too interested in Chris' back catalogue - to put it politely. There were many Best-Ofs - but no Box etc. which puzzles me because many lesser known artists released something like that. So, why should they release an album that never really existed in the first place - and noone (except us die-hard fans) even knows of? The songs that have emerged over the years don't really have the potential of becoming radio hits and the whole album won't be in the same league as commercially successful ones like RTH or Auberge. As much as I wish the work to be published, I have my doubts. I think we can only hope these tapes becomes available one way or the other. I would like more "Live" performances on DVD and Blu Ray. The man is the one who decides on that I'm afraid. But he made an album, old style, so we shouldn't be to negative and keep our hopes up! I ave the feeling he might suprise us. This is brilliant, and I'm sure there are more tapes elsewhere (or from the same source) as Chris himself has said many times he records far more songs than make it to an actual album released. Perhaps the archives will be opened up and a box set of lost recordings can be released. How about ideas for a working title for fun? I'd say 'Songs from the Attic'. I hope so, but in the past the record companies haven't been too interested in Chris' back catalogue - to put it politely. There were many Best-Ofs - but no Box etc. which puzzles me because many lesser known artists released something like that. So, why should they release an album that never really existed in the first place - and no one (except us die-hard fans) even knows of? The songs that have emerged over the years don't really have the potential of becoming radio hits and the whole album won't be in the same league as commercially successful ones like RTH or Auberge. As much as I wish the work to be published, I have my doubts. yes, you are quite logical and reasonable in your assumptions, but the funny thing is that such lost tapes have much greater chances to be released now than the B-sides and other official non-album stuff to be reissued. Unlike all other records, these tapes were never officially released, so there is no problem with buying copyrights or sharing royalties. Since there was an official artwork/sleeve with Magnet copyright on it and (presumably) a test pressing of vinyl release, with Smile album there might be some issues with Magnet copyright holders, but (presumably) far lesser than with official stuff actually released by Magnet/Warner, so Chris may easily release it on his Jazzee Blue label with some support from a major label, e.g. BMG, like it was with the latest album. I think we can only hope these tapes becomes available one way or the other. I would like more "Live" performances on DVD and Blu Ray. The man is the one who decides on that I'm afraid. But he made an album, old style, so we shouldn't be to negative and keep our hopes up! I have the feeling he might suprise us. The same with professional live recordings to be released as retrospective althology box-sets (BBC sessions, Montreux and other festivals) - the copyrights have just to be bought from a broadcasting company, not a label, which is far easier in my opinion, since there was no official release (at least of a whole record), only a broadcast by agreement with CR label and management. 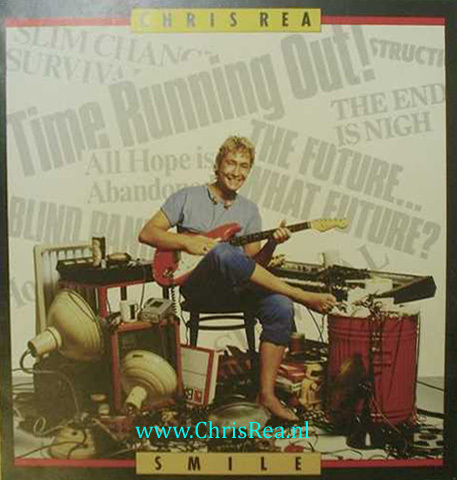 There is at least one more similar unreleased full album record, so called Lost Tape from 1980/81 studio sessions, part of which was released on latter singles (Que Sera, Soft Top) and several songs were re-recorded for Chris Rea 1981/82 album and 1982/83 singles, and also - quite unexpectedly - for Blue Guitars CD3 Louisisana & New Orleans (after this tape was passed onto John Knowles the manager). Unlike Smile, a copy of its master tapes has been circulating among the die-hard fans but still very little known on this record, though its master tapes are most likely available since they were used for B-sides in 80-90s. There must be unreleased demo versions stored somewhere, but very little known on CR songs demos apart from what he says in the interviews. Very early demos from mid 70s are available, but their source and story are beyond me, regrettably. The copyrights issue is the main reason why I have been long withholding my collaborations collection project (see it here: http://chrisrea.nl/community/viewtopic. ... 189#p13179) from official release offer. But now Phil Collins's collaborations compilation to be released by Warner Bros. this fall: https://www.amazon.co.uk/dp/B07F92R41B/ It is pretty much the same kind of project I have been working out for years with Chris Rea records. So I now seek ways for an official release offer since now there is Collins's release of the same kind and it is evident that Warners found it worthwhile to deal with the other artists' copyrights holders, so it seems to me just about time to try to make this project come to life with certain profit for all sides involved - if only somebody who can make it work finds it reasonable to get through. And if this can be done, then my bigger project of expanded reissues can also easily be launched, since within it they do not have to deal with dozens of copyright holders as with duets but just a few. So keep the fingers crossed at least for they keep us posted on this. Last edited by andrew fischer on 26 Jul 2018, 08:05, edited 1 time in total. could you give a track listing for that Lost Tape? I wonder which song on BG CD3 is that old! Some really interesting knowledge there Andrew, it's fascinating knowing there are potentially a river of songs by Chris we are yet to hear ! Hi Andrey, could you give a track listing for that Lost Tape? I wonder which song on BG CD3 is that old! Hello Elangelo, nice to see you back here! So you can see this case is very similar to Smile album, but vice versa, here the phonogram is available but not the artwork or even the album's name. My guess is after self-produced and poorly sold Tennis album Magnet said this way it does not work (since this Lost Tape indeed sounds very similar to Tennis, production/arrangement-wise), scrapped the ready-to-release tape and hired Jon Kelly to produce the album the way they wanted, close to Gus Dudgeon's way (and I must say they were right, to be honest, and Jon Kelly proved it much later - but still that album did not sell well, most likely due to short funding and/or Chris's lack of enthusiasm for promoting it). Some really interesting knowledge there Andrew, it's fascinating knowing there are potentially a river of songs by Chris we are yet to hear! Hope this helps understanding what we can expect from an expanded reissues project.